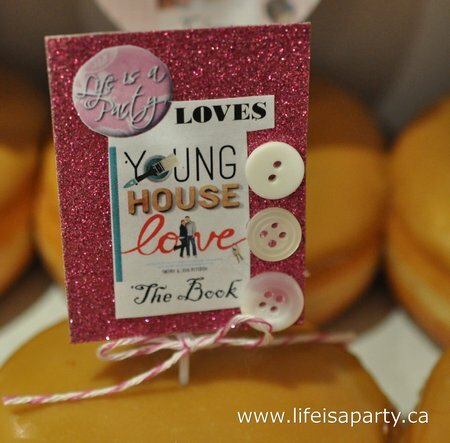 Last night was the big night, the Toronto book signing for Young House Love! 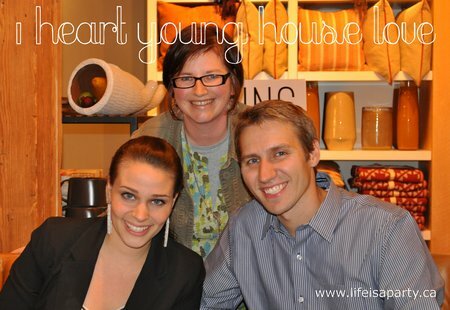 John and Sherry of Young House Love are blogging super stars and just published their first book. And, the book signing was awesome. I had so much fun. I wanted to make a few prezzies for John and Sherry, so here’s what I came up with. 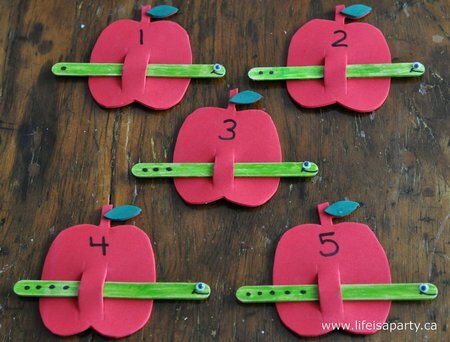 For the worm loving Clara -their sweet little girl, a little number matching game, inspired by this one. So cute right? I was definitely going for the cuteness factor. And for John and Sherry, maple donuts from Tim Horton’s, because it doesn’t get much more Canadian than that! 😉 In a shameless attempt to get a shout-out in their next book tour post, I wanted to up the cuteness factor even more, so I got my craft on. 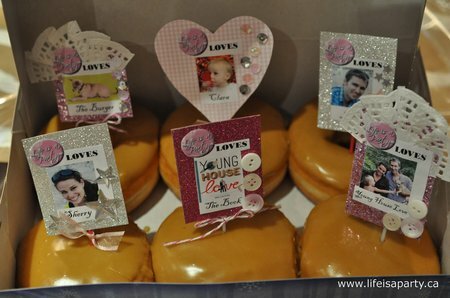 I printed up these sweet little cupcake pics that say “Life is a Party LOVES….The Book, John, Sherry, Clara, Young House Love and The Burger! (their doggie)”. I fancied them up with glitter paper, doilies, and embellishments, ’cause love is in the details. Then I packed them all up in cello wrap and hoped they’d like them. 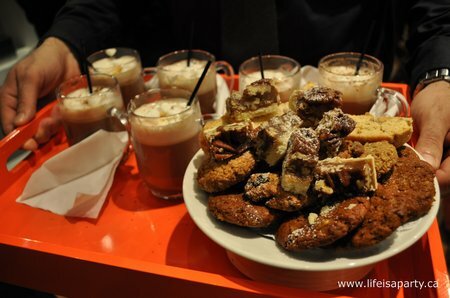 I had read some other bloggers suggestions on what to do and not do, so I was all prepared for the big event. I packed up my umbrella -it was raining, my camera, an extra battery camera -lets just say I’ve learned that lesson the hard way, an on-the-go dinner, and wore my comfy shoes. 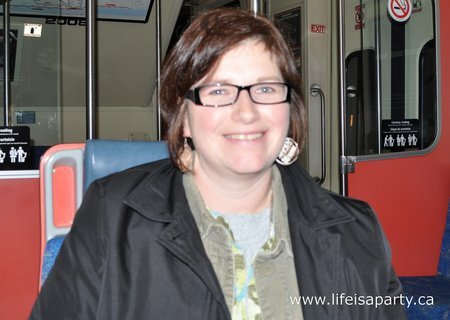 I met up with my friend Julie and we took the train downtown. We’re both kind of in-experienced go-trainers, but it worked out great, and the store was just a 5 min. walk from the station. Even the rain couldn’t dampen our spirits. We got there around 5, and there was already a good line up started so we grabbed our spot, and settled in. We were soon joined by our friend Allana, and took turns shopping, holding our line spots, and nervously giggling about meeting Sherry and John! 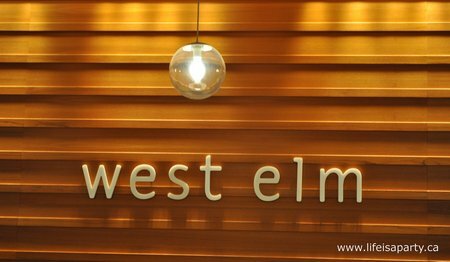 The West Elm folks brought out some lovely refreshments, hot chocolate and holiday cookies. They were so yummy. If you follow Life is a Party on Facebook, you might have seen my instagram when John and Sherry arrived and started signing. The signing started shortly after 6, and it was our turn by about 7 or so. It was so exciting as we inched closer and closer. Here I am having my little moment with them. They oohed and awed over the gifts just as I had hoped -and Sherry was really into the little Canadian Flag I’d tucked into the donuts. They were so nice, so sweet, and so encouraging. I already loved them, and now I really do love them even more. I told them I was trying to turn my blog into a full-time business and Sherry offered some really encouraging advice to stick with it, and that she found that after about 3 years things really start to happen. Here’s hoping. Then she added “or if you get a big break”, and I just had to say “or if you get a shout out on Young House Love” and we all laughed -guess you had to be there. They posed for pictures, and wished me luck and thanked me for the little gifts, and I just couldn’t stop smiling. My friends went up, and I took more pictures for them, and we signed the guest book on our way out, and I was still smiling. It was such a fun night. I can’t wait to read the book. When you’re hanging out with John and Sherry for the night, life really is a party! This post is linked up at The 36th Avenue, The Artsy Girl Connection, House of Hepworths, Bloom, Whipperberry, Tatertots and Jello, Tidy Mom, and Craftberry Bush. your picture made it! I was so excited when I saw you on their post! i wasn’t able to make it but it looked like a lot of fun. tell me how the book is. Hi Elysha, The book is great! It would be right up your alley -and congrats on your news! Hey Dannyelle!!! 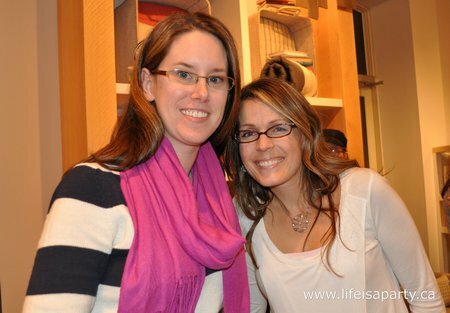 Haven’t seen you in ages, but Jen told me about your blog….so awesome!!! 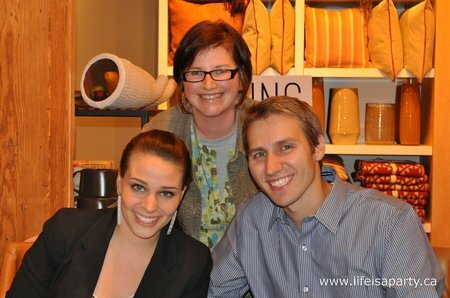 Then, saw your pic with John and Sherry on their blog!!! SO SO cool!!! 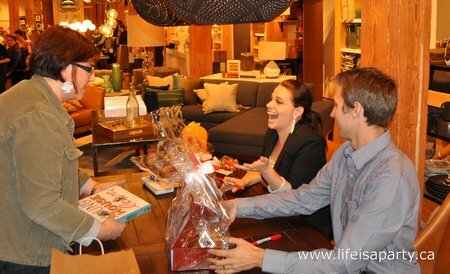 I’ve been following them for a couple years now…..I had RSVP’ed weeks ago for the signing and my friend and I were literally all set to go, books purchased….gifts made, umbrellas in hand and I got a horrible call that my Grandmother was passing…. 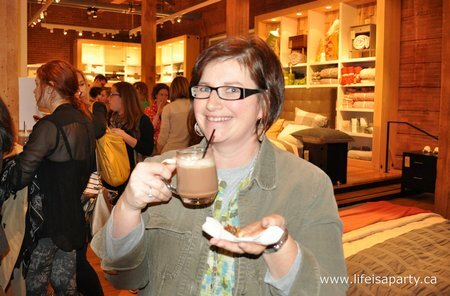 :( so, I didn’t get to go…:( I was so excited to see you made it down and got your pic on the blog…so exciting! John and Sherry rock. Hope you have a fantastic weekend! Hi Candy, Sorry to hear about your Grandma and that you couldn’t make it to the signing. 🙁 Maybe next time. So glad your enjoying the blog!